To redeem your Farmers eVoucher, visit www.farmers.co.nz or take a printed copy of your eVoucher into your local Farmers store. 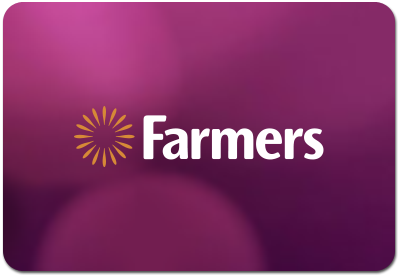 Your Farmers eVoucher can be used for the purchase of goods at any Farmers store, including online at www.farmers.co.nz. Your eVoucher cannot be used at counters operated by third parties. Your Farmers eVoucher may not be returned, redeemed for cash or used as payment on any Farmers Finance Card or Fixed Instalment account. Any unused value on the eVoucher expires on the date shown above. After this date the eVoucher becomes void and cannot be used. Farmers is not responsible if an eVoucher is lost, altered, damaged, destroyed or stolen, or used without permission.